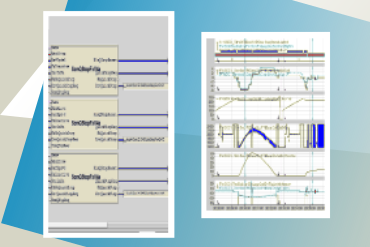 The target of the project was to design, prepare, test and commission a new process automation software fitting the mechanic changes of existing tandem cold mill (TCM). The system for fast change of work rolls in automatic mode (sequentional steps logic) and for backup rolls change. The system for coils tracking from the beginning of process (entry side of rolling mill) till the end of process (exit side of rolling mill). System is memorizing positions of individual coils in the mill and basic technological information about them (Coil Id, weight, diameter, material code...). The resource communicating with higher level systems, distributing data and controling the subordinary systems. The resource controling main hydraulic cylinder movemnts in the stand controling the rolling force or size of the gap between working rolls. The resource controling hydraulic movements of cylinder for work rolls to bend them to get right profile of rolled material. The resource controling movements of hydraulic cylinder for backup rolls in the stand . The resource controling movements of hydraulic cylinder to move botom rolls depending on the rolls diametres to the right position for rolling of material. The system controling cooling valves to support right amount of cooling emulsion for material in each part of rolling mill. This part of integration test was done in Germany at SMS Group GmbH company. Our parts of project software were merged together with the rest of the project software and tested all together. The main point of the integration test is to simulate whole technological entity and test all programmed parts together to reduce the commissioning time at customer. The commissioning was done at ultimate customer in Russia. The main supplier of the whole technology and master of the whole commisioning was SMS Group GmbH company. The commissioning included hw signal check, movements check and optimalization of control loops, manual and automatic function check, production start and support.